You are participating in Ende Gelaende. What are the legal consequences you might be facing? All systems are trying to counter any changes it is facing from the ouside, and we get to experience that as pressure on many different levels: starting with the pressure some relatives might put on you, up to the police and the court taking action against you. It makes sense to deal with possible repression beforehand, no matter what kind of action, whether state or civil law applies, to get to know the laws applying to the specific situation. We act in solidarity! No one is left alone! Repression is and is meant to be unpredictable; nonetheless, there are some experiences and ideas on what might be happening. However, there are no guarantees. In any case: we will establish support structures that will stand together in solidarity when faced with the consequences of repression – no one will be left alone! The Legal Team for All will be on site, so you will find people to approach with legal questions. Nonetheless, it is important you read the Legal Aid booklet (3rd edition, 2017) *) beforehand. Knowing what you are dealing with, discussing your ideas for action in your affinity groups and well-informed behaviour in general is the base for getting in and out of the action well. You could think about supporting the work of antirepression groups such as Rote Hilfe, AntiRRR, ABC, CAT and others with your donations or even by joining their work. Antirepression work is almost as important as the action itself. Supporting others in their way of dealing with repression is not only important, but also fulfilling – and maybe it is something you might be up to? In case you are facing any legal consequences after the action, please get in touch with the Legal Team for All (legal_team_fuer_alle@posteo.de). Together we will find a way of dealing with repression, and we will use the repression to become stronger rather than weaker! Contact the antirepression structures as soon as you receive any letters from the police or the state prosecution. We can use all allegations brought up against us politicially, make the absurdity of criminalizing climate activists public, and fight back against repression – if you want that too! The action agreement for “Ende Gelaende” 2018, developed in advance, calls for a “publicly announced mass blockade, allowing multiple options for involvement”. Before entering into actions of any kind, check the corresponding sections in the legal aid booklet to find out which charges could be brought up against you. Please try to avoid any wrangling with the police. Although they might act violently it is better not to “push“ back. In the action agreememt we stated that we would not use violence against people! If you are charged with any of these crimes, you are not necessarily going to be convicted. Oftentimes, charges can be dismissed or cases discontinued, e.g. because one did not attract the authorities’ attention before, or because the allegations end up being completely false. If you are however convicted of a crime, we think that it is highly unlikely to be put to jail for any behaviour that lies within the action agreement. Fines are much more likely. If you are working either in the public service, as a doctor, a lawyer or with children (or are aspiring to work in any of these fields in the future), we advise you to read section 5.3 of the legal aid booklet and also consult the legal team in person. RWE can use civil law to take action against activists. One element of civil law they choose to employ quite often is the so called declaration to cease and desist. As these can be quite costly we advise you to contact the “legal team for all“ beforehand. You can find more information on that topic in the legal aid booklet. We are many, we stand together, and we can put up a good fight – politically, in the media and in the court room! It is possible that at some point during the action you encounter RWE’s factory security. They can not demand you to show your ID or give them your data. But they can act within a so called “Public Right to Arrest“. It enables them to arrest you if they catch you “red-handed“, in the middle of committing a crime – they can detain you either until the police arrives, if your identity cannot be established or if you are at risk of flight. If necessary, they are allowed to use violence. Feel free to contact us at legal_team_fuer_alle@posteo.de – please be patient with us; we may need some time to give you a competent answer. The legal team will be present on the site. You can come see us at our tent and talk to us or attend one of our info events if you have any questions. 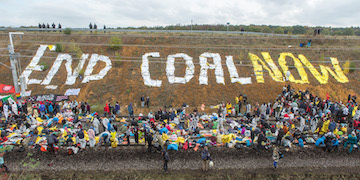 With more general legal questions concerning (climate) activism, you can contact for example the Rote Hilfe (a legal aid group active throughout Germany) or AntiRRR (Antirepression Group rhenish lignite mining area). This third edition entails two important additions. Using your action trainings and info events to call attention on these changes would be highly appreciated! You can find the changes in the section about being summoned by police (p.25) and about the probability of contract penalties when doing blockades in public spaces (p. 32). People affected by declarations to cease and desist (DCD) should definitely consult the legal team before entering into action and/or join the workshop about DCDs at the camp. Please spread the word! Another point has been added: Sitting blockades on public streets (2.2.5).